New graphic design contest on Desall.com: Desall and Lavazza invite you to design the new graphics for their vending machines, capable of conveying the Lavazza values and quality in every environment. The history of Lavazza is that of a business which, for over 120 years, has pursued a company vision based on passion for work, for the product and the land in which it operates. These values have been ingrained in Lavazza’s DNA since its foundation in 1895, and upheld by four generations of entrepreneurs. Each family member who has worked in the company has helped it to grow, transforming it into the company it is today, yet still true to the qualities of passion and innovation inherited from Luigi Lavazza. It is the spirit which has allowed us to expand the company over the years: our way of doing business is an example of sustainability in the fullest sense of the word. It is a quality built up and shared with all the people we have met, starting with our employees and the places in which we work. Lavazza invites you to create the new graphic design for their vending machines, suitable for the various machine models and able to convey the Lavazza brand and the values it advocates, including the Italianness and the premium quality of their blend. 3. It shall contribute to transform the user experience from a proximity-driven consumption (given by the sole presence of the Lavazza vending machine) to a more informed, premium and fulfilling experience. Project typology: the subject of the contest is the graphic design of the Lavazza vending machines, in particular with reference to the front panels and the selection buttons of the Brio Up, Canto Duo, Concerto and Lei2Go machines – see Lavazza_Panels-Dimensions.pdf attached in the Material files for more information. -	Given the average life cycle of a vending machine equal to about 10 years, the graphics you propose shall ensure a certain durability over time, to be perceived not as a fad but rather embodying the traits of a timeless fashion. Vending machine models: the new graphic design shall be easily adaptable to the various machine models, in particular to the Brio Up, Canto Duo, Concerto and Lei2Go machines – see Lavazza_Panels-Dimensions.pdf attached in the Material files for more information. 5. Selection buttons: for the design of the selection buttons you are invited to propose graphic solutions of your own conception. For the beverages label texts, you are free to use the font already employed by Lavazza – see LAVAZZAtxtbook.ttf attached in the Material files – or suggest a font of your choice. At all events, the selection buttons are not the main subject of the contest. Dimensions: the graphic design you propose shall be suited to the four vending machines as better specified in the Lavazza_Panels-Dimensions.pdf document attached in the Material files. Style: you are free to explore the style you prefer, keeping into consideration both the necessity of becoming extremely relevant and attractive for the customer and the average life cycle your graphics shall have, avoiding styles or concepts too much related to a specific historical-cultural period. Techniques: you may use graphic illustrations or other techniques, however avoiding the use of photographs. Colour indications: the are no indications as to what colours you should employ in your graphic design. Logo: as better specified in the “Elements to be included in the graphic design” paragraph, the Lavazza logo provided in the Material files shall always be included in your proposals, receiving maximum visibility and importance with respect to the other elements. The logo might be used either vertically or horizontally. You can find the Lavazza logo and the “Aroma Mark” in vector format, inside the Material files. Context of use: the vending machines will be installed both in working environments (companies, offices, etc.) and in public spaces (stations, hospitals, universities, shopping malls etc.). - Layout containing the new graphic design of the selection buttons. We remind you that you may attach further materials (PDF, vector files, high resolution images) inside a .ZIP archive to submit directly from the upload page. Participation is free of charge and open to designers and creative talents of any nationality aged 18 years or older. Participants can present one or more projects, but only the projects published on the www.desall.com web site, via the upload page related to “Lavazza - New vending creativity” will be accepted. The selection of the winner by Lavazza will be the result of an unquestionable evaluation and it will take into account originality, feasibility and consistency with the brief presented. 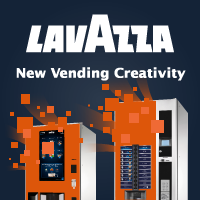 Do you want to stay updated about "Lavazza - New vending creativity"?